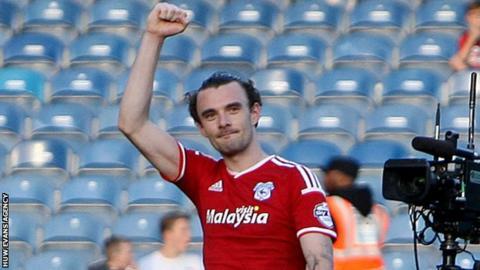 Defender Scott Malone says Cardiff City are capable of achieving automatic promotion from the Championship. His spectacular last-minute strike earned a 2-2 draw at Queens Park Rangers to maintain their unbeaten start in all competitions. Malone, 24, said a specific target has not been discussed at the club. But he added: "The way we're playing and the vibe in the dressing room, why can't we finish in the top six, if not the top two?" Clint Hill and Charlie Austin put QPR 2-0 up at Loftus Road before skipper Sean Morrison reduced the deficit and Malone's dipping 22-yard effort earned QPR a point. Russell Slade's side began the Championship season with a 1-1 draw against Fulham, followed by a 1-0 League Cup win over Wimbledon. Since losing at Ipswich late last season, they have not been beaten in six games. Cardiff finished 11th last season - their first since Premier League relegation - and Malone said Cardiff must avoid a similarly "up-and-down" campaign. "If we can keep drawing and keep winning this year, then we can be right up there," he said after scoring his first goal for the club following his arrival from Millwall in January. Cardiff travel to Ewood Park to face Blackburn on Tuesday.